← I’ve finished my wavy shell blanket at last! Well, I’m still crocheting away at the blanket I’m crafting for my daughter, and I’m now on the 5th of 6 sections, so I’m really hoping that I’ll be able to finish it soon. It’s a shame I couldn’t get it done by later on today, as Brex has been visiting with us, and I would have loved to give her the blanket to take home but, as she’s leaving for Bristol this afternoon, I know there’s no way I’d be able to finish it in time. 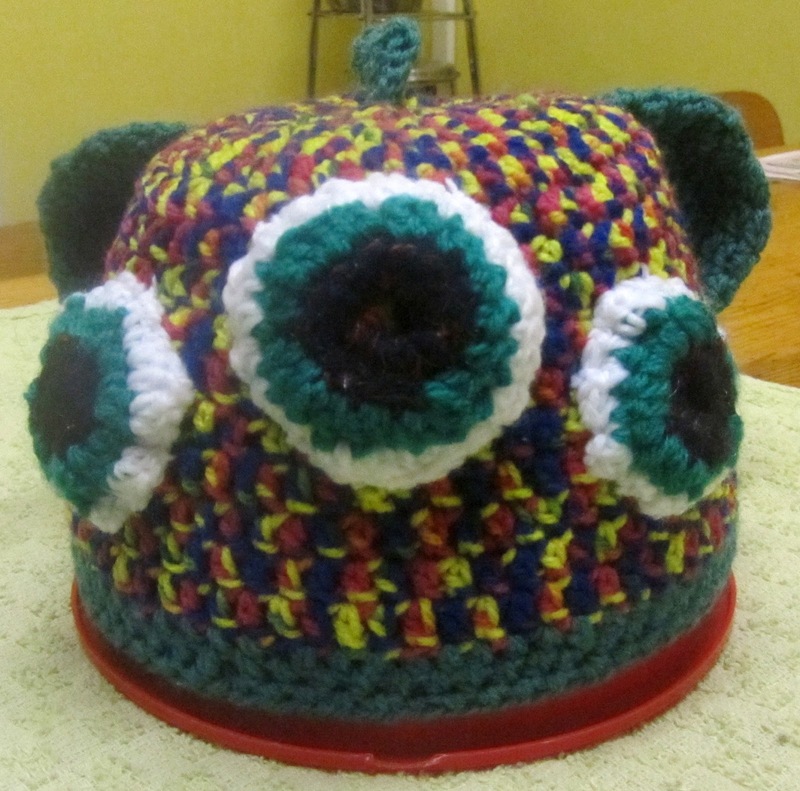 Brex has a friend who is having a baby very soon, and she had been telling me how she wished she was better at crocheting, as she wanted to make a gift for the baby. As she’s still only at the practise stage, I offered to make something for her. 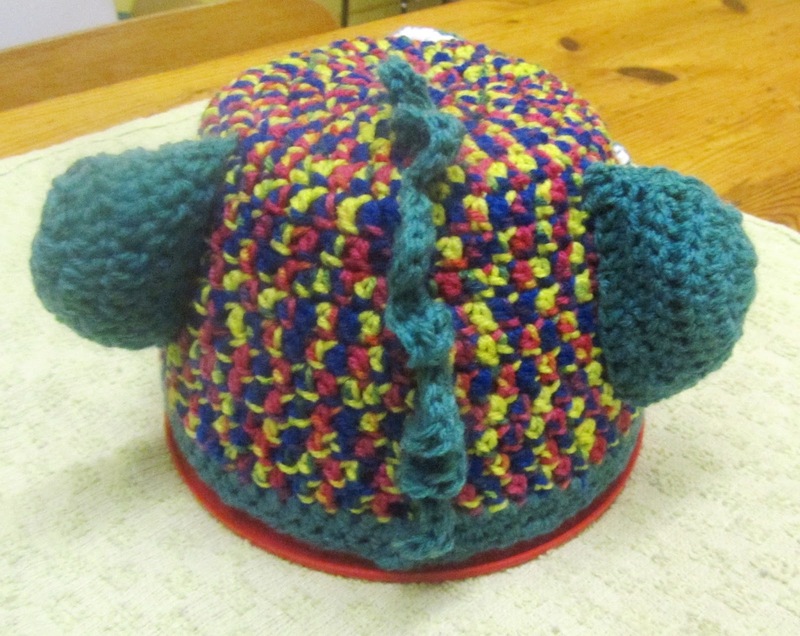 We decided on a hat and, as her friend has a really great sense of humour, Brex asked me if I could manage something different to all the usual baby bonnets, preferably with bright colours, and with a daft theme – maybe a monster hat? Well, as I’m totally new to crocheting baby items, I went online to my favourite crochet tutor, Claire, from BobWilson123, who has an amazing amount of tutorials on YouTube. Well, the big grin that spread over her face said it all so, with a lot of trepidation, I started following the videos, to see how I could work this out . . . 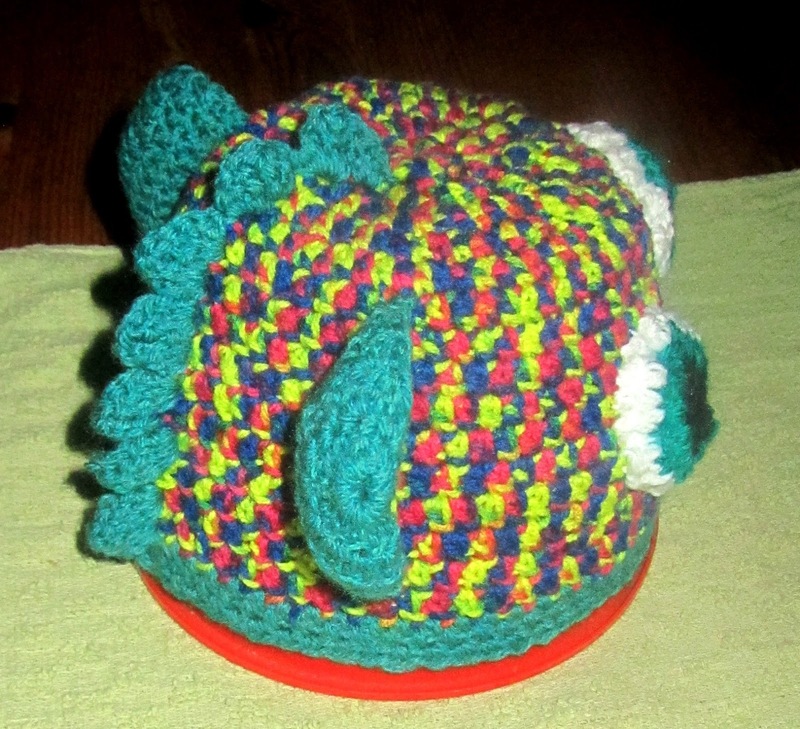 This is the front view of what I labelled the, ‘My Little Monster‘ Hat. The basic baby beanie was made from Robin Paintbox DK wool, which is 100% Acrylic, and the beanie came from Claire’s Beanie with Bear Ears. I used my favourite Foxy DK Jade Green wool for the contrasting edging, and the cute bear ears, as well as the spine at the back. I must admit, I’m so very glad that it turned out so well, and doing this has given me the courage to experiment a bit more – but only once Brex’s blanket is finished, of course!